Subject: Implementation of the recommendations of the Seventh Central Pay Commission as accepted by the Central Government - Revision of pay scale of the employees of the Corporation- Reg. 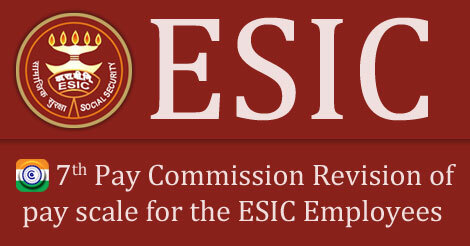 The ESI Corporation in its 169th meeting held on 06-09-2016 has given approval to amendment of the First Schedule of the ESIC (Staff and Conditions of Service) Regulations, 1959 giving effect to the implementation of the 7th Central Pay Commission’s recommendations in the ESI Corporation, as accepted by the Central Government. The said approval of the Corporation has been ratified by the Ministry of Labour & Employment (MoL&E) as communicated vide their letter No.A-11014/01/2016-SS-I dated 25.10.2016. 2. In accordance with the above, the revised level as well as the initial pay in the new pay matrix corresponding to the existing pay in the Pay Band and Grade Pay applicable to various categories of employees of ESI Corporation are given at Annexure - 1 & 2. 3. A copy of the Central Civil Services (Revised Pay) Rules, 2016 as notified by the Central Govt. vide Ministry of Finance (Department of Expenditure) Notification No.GSR-721(E) dated 25.07.2016 (may please be downloaded from Government portal) may be referred to for the purpose of fixation of pay in the revised level of pay as well as the initial pay in the new pay matrix. The revised level of pay in the new pay matrix along with the CCS (Revised Pay) Rules, 2016 may kindly be brought to the notice of all employees immediately. The employees may exercise their options in writing in the prescribed proforma given at Annexure – 3 within three months of the issue of this Memorandum as per Rule 5 & 6 of the CC5 (Revised Pay) Rules, 2016. It should be ensured that the contents of this order are noted by all employees including those who are on leave and those who have since retired from the services of the Corporation after 01.01.2016 so that the need for extending the date for exercising the option does not arise. The option once exercised shall be final. 4. Following guidelines are given for expediting the fixation of pay in the revised pay matrix regulating the payment of arrears of pay as a result of implementation of the recommendations of the 7th Central Pay Commission. (i) Those employees, who give timely option to switch over to the revised level of pay in the new pay matrix, their pay may be fixed in the level corresponding to the applicable pre-revised Pay Band plus Grade Pay. Pay and allowances for the month of November, 2016 may be drawn and paid on the basis of revised pay matrix and the applicable existing pre-revised allowances after deduction of enhanced subscription to the Provident Fund, which will be calculated with reference to the revised basic pay. In so far as the employees who have joined on or after 01.01.2004 are concerned, the enhanced deduction under the New Pension Scheme will be calculated w.r.t. the revised Basic Pay and DA thereon. (ii) In terms of CCS (Revised Pay) Rules, 2016, there shall be two dates for grant of increment namely, 1st January and 1st July of every year, instead of existing date of 1st July, provided that an employee shall be entitled to only one annual increment either on 1st January or 1st July depending on the date of his appointment, promotion or grant of financial upgradation. The increment in respect of an employee appointed or promoted or granted financial upgradation including upgradation under Modified Assured Career Progression Scheme (MACPS) during the period between the 2nd day of January and 1st day of July (both inclusive) shall be granted on 1st day of January and the increment in respect of an employee appointed or promoted or granted financial upgradation including upgradation under MACPS during the period between the 2nd day of July and 1st day of January (both inclusive) shall be granted on 1st day of July. For drawing the annual increment, the rule position stated in the respective CCS (RP) Rule, 2016 may be referred to. For fixation of pay, the Government of India, Ministry of Finance, Department of Expenditure O.M. No. 1-5/2016-IC dated 29.07.2016 may be referred to (This may please be downloaded from the Government portal). In order to ensure correct and systematic fixation of pay in the revised pay matrix, a proforma for the purpose (Statement of Fixation of Pay) annexed with the said Government of India O.M. dated 01.08.2016 is enclosed (Annexure- 5). The statement should be prepared in triplicate and one copy thereof should be pasted in the Service Book of the Government servant concerned and another copy made available to the concerned accounting authorities for post-check. Attention is also invited in this connection to the Government decision contained in Government Resolution No.1-2/2016-IC dated 25th July, 2016 (This may please be downloaded from Government portal), which may be referred to. (i) Bills may be drawn separately in respect of arrears of pay and allowance for the period from 1st January, 2016 (or the date opted by the employee) to 31st October, 2016. The arrears, computed after deduction of subscription to GPF and NPS on revised Basic Pay, may be paid in one installment. DDOs will ensure that action is taken simultaneously with regard to Corporations’ contribution towards enhanced subscription of New Pension Scheme, minimal level of GPF. Income Tax, as may be due, shall be deducted before payment of arrears. (iv) The revised pay structure effective from 01.01.2016 includes the Dearness Allowance of 125% sanctioned from 01.01.2016 in the pre-revised pay structure. Thus, Dearness Allowance in the revised pay structure shall be zero from 01.01.2016. The rate and the date of effect of the first installment of Dearness Allowance in the revised pay structure shall be as per the orders to be issued in this behalf in future, by the Government of India. (v) The decision on the revised rates and the date of effect of all Allowances (other than Dearness Allowance), based on the recommendations of the 7th Central Pay Commission are yet to be notified by the Government of India. Until then, all such Allowances shall continue to be reckoned and paid at the existing rates under the terms and conditions prevailing in the pre-revised pay structure as if the existing pay structure has not been revised under the CCS (RP) Rules, 2016 issued on 25.07.2016. (vi) With a view to expediting the authorization and disbursement of arrears, it has been decided that the arrear claims may be paid without pre-check of the fixation of pay in the revised pay structure. The facility to disburse arrears without pre-check of fixation of pay, will not, however, be available in respect of those Corporation employees who have relinquished service on account of dismissal, resignation, discharge, retirement, etc., after the date of implementation of the Pay Commission’s recommendations but before the preparation and drawl of the arrear claims as well as in respect of those employees who had expired prior to exercising their option for the drawl of pay in the revised pay structure. (vii) The requirement of pre-check of pay fixation having been dispensed with, it is not unlikely that the arrears due in some cases be computed incorrectly, leading to overpayments that might have to be recovered subsequently. Therefore, the Drawing and Disbursing Officers should, therefore, make it clear to the employees under their administrative control, while disbursing the arrears, that the payments are being made subject to adjustment from amounts that may be due to them subsequently should any discrepancy is noticed later. For this purpose, an Undertaking (Annexure-4) may also be obtained in writing from every employee at the time of disbursement of the arrears upto October, 2016 to the effect that any excess payment that may be found to have been made as a result of incorrect fixation of pay in the revised pay scales I pay matrix, will be refunded by him / her to the Corporation either by adjustment against future payments or otherwise. (viii) Officer In charge of Finance and Accounts Branch of each Field Office is hereby authorized to concur the pay fixation for implementation of 7th Central Pay Commission recommendations as accepted by the Central Government, wherever Joint Director (Finance) is not posted. Pay as per the above instructions is to be fixed and arrear shall be drawn for employees from place of their present posting. Thereafter, copy of “Due and Drawn” statement may be sent to the concerned offices (where the official has been working since 0101.16), immediately after release of arrears, for making necessary entries in the relevant registers. (ix) Since the funds for payment of October, 2016 salary (second limit) has already been released on 24.10.2016 to all accounting units, requisition of funds in response to this Memorandum may be raised separately with Finance & Accounts Division of Hqrs. Office, for early disbursement of arrears. Receipt of this Memorandum may kindly be acknowledged. Hindi version follows.